9/16/2008Share this story on Facebook! 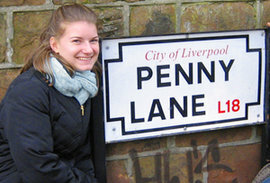 Mary Michalow '10 visited Penny Lane while spending a semester at the Ithaca College London Center. 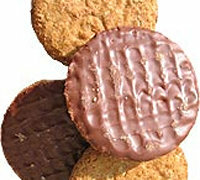 A few years ago, cartoonist Dave Kellett bemoaned the fact that he couldn't get HobNobs, "the finest, most unbelievably tasty cookie in the world," in his hometown. But we can! A number of stores sell them in Ithaca including the student-favorite Ithaca Bakery. Mary plans to vist New Zealand next. Where would you like to go on your semester abroad? Imagine a compact version of the Ithaca College campus squeezed into an old Victorian mansion in the heart of Kensington, and you’ve got a pretty accurate description of the ICLC. It’s a much homier, less independent study-abroad option, perfect for students who crave an IC home away from home. As soon as I received my acceptance letter into the ICLC study-abroad program, I began receiving e-mails and letters from ICLC trio Bill Sheasgreen, director of the program, Sarah Davies, the program assistant, and Heather Blackburn, the operations manager. I received step-by-step guides to visas and passports, packing tips, and class registration information. Once I arrived in London, their help and advice only increased. They helped me go over the lease agreement for my flat, helped me navigate the Tube (London’s subway system), and pointed out a hundred different ways of pinching pennies to make the exchange rate more bearable. If Bill, Sarah, and Heather fit the role as surrogate parents during my study-abroad experience, the 86 other IC students who studied abroad with me became my siblings and partners in crime. We took classes together, competed against each other to win Bill’s trivia questions, got lost in foreign cities together on the weekends, and stampeded Bill’s office every week for coffee talk, fighting over the last chocolate HobNob biscuit. Until recently, even comic strip characters complained about how hard it was to get HobNobs in the U.S. See the sidebar to learn where you can find them now. With such an amazing group of people as my support system, my semester in London was nothing short of incredible. I traveled until my passport was dog-eared and my Tube map was tattered from constant use. I still get breathless rambling off all the places I visited and the things I did. I went on all four ICLC subsidized trips and saw Stonehenge, the Roman baths, the hometown of the Beatles, and Shakespeare’s birthplace. I took weekend trips to Prague and Dublin and spent spring break in Italy and Spain. I exhausted all of London’s museums, seeing the Rosetta Stone and Elgin Marbles in the British Museum and paintings by Anthony van Dyck and Thomas Gainsborough in the National Gallery. 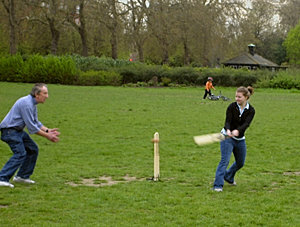 I witnessed the controversial Beijing Olympic torch relay, cheered on 36,000 runners at the London Marathon, straddled the Prime Meridian at Greenwich, and learned how to play cricket in Hyde Park. But I did more than just observe British culture—I lived it. I learned through experience, or as Bill says, “doing the knowledge.” I commuted on the Tube every day with native Londoners and learned to deal with the unpredictability of public transport. I gained cultural awareness as well as journalistic skills when I interned at welcomestranger.com, a travel magazine and social networking site, and I worked side-by-side with Brits, Aussies, and South Africans. I got swept up in football and rugby mania. I became a tea drinker and a biscuit aficionado. Of course, there were also classes. I intentionally signed up for classes I would not have taken otherwise, just to try something different and unfamiliar. I’ve never taken an art history class, so British Art and Architecture made the cut. On a whim, I decided to take British Pop: Contemporary British Music, even though I don’t have a musical bone in my body and avoided music classes in high school. Most classes at ICLC are specific to London, but a few are classes offered on the home campus with an added London twist. For example, in my Shakespeare class we saw productions of every play we read. The classes I took did not directly fulfill my major or minor requirements, but they did fulfill the general liberal arts electives that are required for graduation and were by far the most interesting classes I’ve taken thus far in college. I loved visiting art museums, cathedrals, and villas as field trips for Art and Architecture, and I attended David Gray and Roni Size concerts and Billy Elliot the Musical as part of my British pop class. Now I’m back in the United States, where mac and cheese and normal-tasting peanut butter are readily available (boxed macaroni and cheese does not exist in London, and the local brands of peanut butter are awful). It’s good to be home, but it’s also a bit of letdown. I get nostalgic when I watch movies filmed in countries I visited, and I find it strange not to be traveling every weekend and living out of a suitcase. I’ve been bitten by the travel bug and am considering studying abroad again next year on the other side of the world in New Zealand. Care to join me?